Pixabay How you handle Halloween treats can help your child navigate food choices later in life. But as much as I love the holiday, it also has its share of detractors. There is plenty of debate about whether parents should limit their kids' access to Halloween activities and candy, in the name of fending off a lifetime of sugar cravings, or let them eat their fill. With childhood obesity on the rise and many parents eager to limit added sugars in their children's diets, which approach is best for helping kids learn healthy eating habits? I spoke to dozens of parents about how they handle Halloween candy, many of them fellow dietitians. At one end of the spectrum of control are parents who avoid taking their kids trick-or-treating and take them swimming or bowling instead. They say their kids haven't complained about missing out on the festivities. And there are the parents who subscribe to the “switch witch” or “candy fairy” approach. They take their kids trick-or-treating and may let them have a couple of pieces of candy that evening. But once the kids are in bed, the parents switch out the candy stash for a toy. Blaming the candy's disappearance on a witch or fairy helps displace any anger the kids might feel toward their parents. Penn State research shows, however, that girls who have treats on a regular basis eat less of these foods when they are offered them and tend to be slimmer. Another study from the Netherlands compared the eating behaviors of children who were told they couldn't have sweets, couldn't have fruit or were permitted to eat what they wanted. The restricted groups wanted more of the foods they weren't allowed to have and ate more overall. This suggests that a deprivation mentality backfires when it comes to teaching self-regulation and weight management. According to research, though, letting kids indulge in as many treats as they want is linked to them being less in tune with the signals their body sends them when they are full. Kids of parents with an indulgent feeding style also have more trouble regulating themselves around food and tend to weigh more than other children. So it seems that allowing kids to eat all the candy they want teaches them to ignore their satiety cues, setting them up to be overweight adults. As a dietitian, I tell parents to approach Halloween as a learning opportunity. Sweets and other treats are part of life, and sheltering kids from less healthy foods doesn't teach them how to manage them and regulate their eating as adults. Here are my suggestions on how to let your children enjoy the treats of Halloween without going overboard. Have candy after meals and with snacks. According to dietitian and family therapist Ellyn Satter, author of “Child of Mine: Feeding With Love and Good Sense,” it's fine to let kids have a few pieces of candy a day, either as dessert after a meal or as a sit-down snack. You can include a piece of candy in their lunch if they want. This encourages mindful eating rather than distracted eating in front of the TV or on the run. Eating small amounts of treats should help kids learn to savor them and enjoy them more so they're satisfied. Having these treats after a meal or snack means there will be less room for candy, plus the protein and fat will help slow down the sugar rush. If they are asking for snacks at bedtime, offer a healthy option that they can follow with a small piece of candy (though if sugar makes them hyper, bedtime might not be the best time for treats). Let your kids know that if they're able to stick to these rules, they can have control over their candy stash. If they can't, the parent should take charge. Make sure you communicate the plan before trick-or-treating so everyone knows what to expect. Keep candy in a tall kitchen cupboard. Out of sight, out of mind. This holds true for kids and adults when it comes to food. Don't let kids keep candy or other food in their rooms. Food stays in the kitchen, and the less healthy options should be hidden in a cupboard, not out on the counter for all to see (and grab mindlessly). Let them pick their favorites and “make it worth it.” Have your kids pick out the candy they love and give away the rest. Learning to choose treats you really enjoy is an important part of healthy eating. You want your kids to savor and enjoy the treats they love rather than go for volume and not really take pleasure in what they're eating. Focus on healthy living, not weight. When you talk about food with your kids, focus on making healthy choices rather than controlling weight. Research suggests that commenting on children's weight can increase the likelihood of unhealthy dieting as well as binge eating and other eating disorders. Use Halloween as a growth opportunity for the family. Think about how you want your family to approach food and treats, and consider the example you're setting with your eating habits. 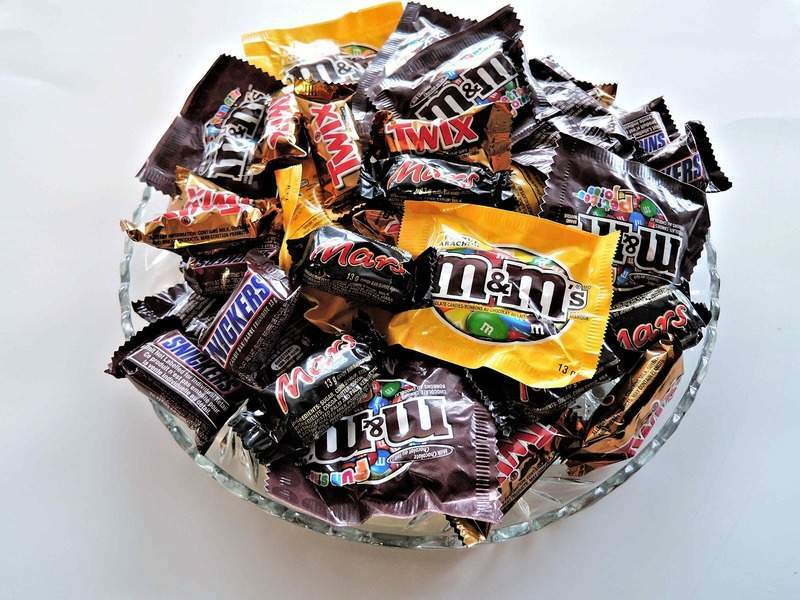 Do your kids see you making your way to the candy bowl every night? Practice the same balanced food habits you want your kids to have as adults. I'm willing to bet you'd all be healthier and happier as a result.